Did you know dogs have three eyelids? I knew they had at least two. 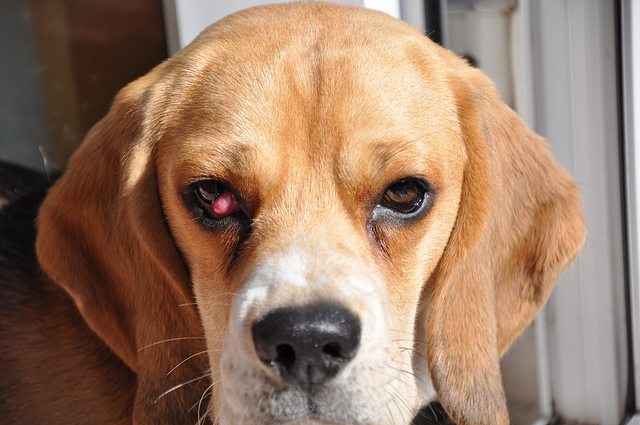 For some dogs, including beagles, that third eyelid can develop a problem commonly known as cherry eye. A beagle with cherry eye. Photo courtesy of Snobbig2010 via Flickr. The third eyelid gives the dog's eyes protection from dust and other debris, and also provides some of the moisture to that eye. But sometimes the tear gland in that eyelid pops out, leaving what looks like a bubble at the eye. That's cherry eye. "It is thought to be hereditary, but the exact cause is unknown," said Dr. Angela Chesanek, a veterinarian at SPCA of Central Florida. "Most common in certain breeds (English Bulldog, American cocker spaniel, sharpei, Newfoundland, beagle, and a few others) but any dog can get it." Even cats can get it. Is it a problem? Veterinarians say it can be. 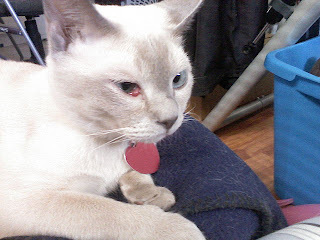 A Tonkinese kitten with cherry eye. Photo courtesy of CarlosTheDwarf via Wikimedia Commons. 1) It means there's an issue with the third eyelid. It is not a cosmetic issue. 2) If cherry eye happens in one eye, it could happen in the other. 3) The gland (now prolapsed) can get dry and irritated. The pet may paw at it. 4) Blood flow to the area is affected. 5) "If the gland ulcerates and becomes infected, replacement may be necessary for tear production -- and to prevent painful dry eye," Dr. Chesanek said. What is Dry Eye? A form of conjunctivitis. And it requires medication for the rest of your pet's life. The eye will find a way to keep moist any way it can. It could start using mucus. The eye will get gooey, and that could affect the cornea, and eventually vision. There are a lot of ways to fix cherry eye for doctors. I found a video on Youtube of a vet literally pushing the gland back in an English bulldog with a Q-tip. It's kind of gross, I won't post it here. Just search cherry eye. Some cases involve surgery. Dr. Chesanek suggests taking the dog to a vet ophthalmologist, but a vet can perform the surgery too. "Surgery with a specialist is typically more -- can be up to $1000 for one eye," Dr. Chesanek said. "With a non-specialist veterinarian it typically ranges from $300-$500 -- for one eye. This charge covers bloodworm, anesthesia, etc. Charges vary greatly depending on the city." As long as you take care of it, you shouldn't have to worry about removing the whole gland. Of course, there is always a chance that this cherry eye may reappear. Which means you may need surgery again. Information from PetMD.com and petinsurance.com also contributed to this report. There is a veterinary opthamologist here who I believe does a "simple" procedure to correct cherry eye. The dog doesn't even have to be anesthetized. Of course, I think the chances of it returning are pretty high after the procedure. Yeah, the Youtube video was fascinating. A little anesthetic, and the vet popped it back in with a Q-tip. And yeah, I bet it will still be a problem. To be honest, I didn't even know there was such a thing as a veterinary opthamologist until I wrote this. Learning so much from blogging.